Prince George, B.C. – Prince George RCMP say the Hart Highway will remain closed north of Austin Road for several hours following a two-vehicle collision late Friday afternoon. 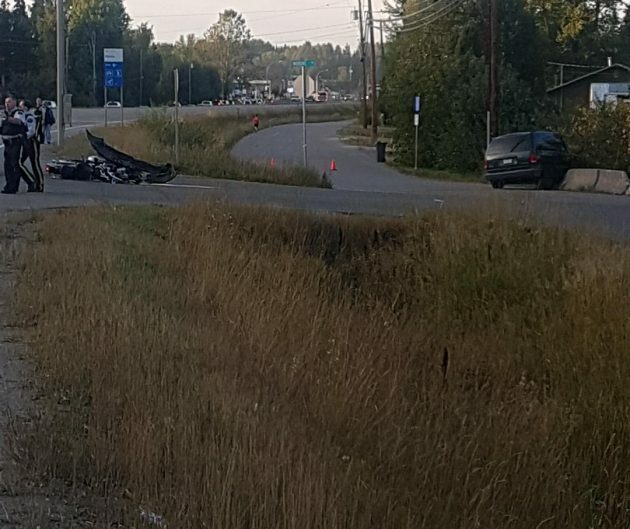 Several emergency crews responded to a two-vehicle impact involving a motorcycle and a van at Nordic Drive and the Hart Highway at about 5:40 pm. Initial information was that two people had been injured. While police are not releasing details at this time the City detachment says the highway will remain closed “for several hours” while an investigation continues. There is no information available on possible injuries or number of people injured. Highway 97 is closed in both directions in the vicinity of this accident and traffic is being re-routed on South Kelly Road. DriveBC hopes to provide an update on the highway closure at 10 pm. Update – DriveBC indicates that as of 10:01 pm tonight the collision site on the Hart Highway is clear. Picture sure says a lot… not the whole story of events, but a lot. I see the bumper of the van still attached to the bike… so the van came from the highway area, which is quite far from where it ended up… no skid marks visible and then it wouldn’t be easy to get a low profile van overtop a concrete barrier. Looks like a failure of braking for sure. From 80kph one should be able stop in the distance from the bumper to where the van ended up; to say nothing of what happened prior to losing the bumper. Probably another cager blissfully unaware of his or her surroundings. From the way the bikes pointing maybe they made a left hand turn in front of the van ? Just my amateur opinion250 accident reconstruction opinon …. I hope that the motorcycle rider(s) is (are) did not get severely injured and make a full recovery! By the way, the speed limit for all vehicles on the Hart Highway is 70km per hour! We know thats a friggin joke. Most people can’t read posted speed signs. Yes and then they get mad at the ones who can. Good heavens when will they learn to drive in PG. You have to get out of the “bush” mentality. vehicle’s are dangerous when not following the rules. Quick search of the Abbotsford News reveals there was a two vehicle crash on Watcom Rd last night. One person died. Is that anywhere near your outhouse R-02 ? Kimmy-aka r02- thinks that there are never any accidents in that smelly town as he has never seen one. Must not get out much. R02 in Abby, do you have a News/Opinion site in your picture perfect Eden (!) that is accessible to commets like this one? If you have one – and I sincerely doubt it – would you be so kind to let me know? Don’t ask why, because I just want to get even for all your spiteful comments about your former home town Prince George! Any drive-by shootings in Abby this week? How many have you had so far this year? Wasn’t it you 02 troll commenting about how you’re picked on?sad little troll you are. Good heavens Retired 02, you really must dislike living in Abbotsford. Your never-ending efforts to denigrate PG suggests that you are perhaps just trying to make yourself feel better about the cesspool that you now call home! PG baaaaaaad, Abby goooooooood! Does that make you feel better now? Nothing like living in a place where you can fart to your heart’s content and NOBODY notices! Good Lord! Do those who surmise, know how this incident happened, whose fault it was? We don’t know. You know where to put your comments, starts gossip which is kinda cruel to the family of the person who died. Give it a rest. Then, it degenerates in to crap about a guy living in Abbotsford, who used to live here dumping on PG and the mudslinging ensues.